Ormiston and Heriot-Watt-University suffered weekend disappointment in their bid to secure the second promotion slot from the First Division. Ormiston suffered a 7-3 reverse to Eyemouth United with United 5-1 ahead at the interval. Dean Woods, Craig Wojtowycz and John Morgan netted for the visitors, whilst Heriot-Watt lost 1-0 at Burntisland Shipyard thanks to a goal from former Watt player Brendan Napier. 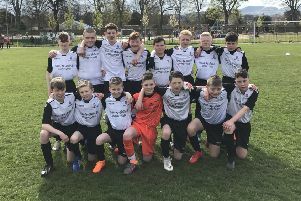 The students have a chance to climb into second spot tomorrow night when they travel to Hawick Royal Albert (7.30pm kick-off) and will be confident of success following a 3-0 win at Albert Park in March. Ormiston have a double header with Duns to come but manager Brian Johnston was not happy with his side’s weekend performance. “It was a shocking display from us and with Duns winning at Hawick, it keeps it interesting. “We have a double header against them now but Heriot-Watt have one extra game, if they win it they are in the driving seat,” said Johnston.